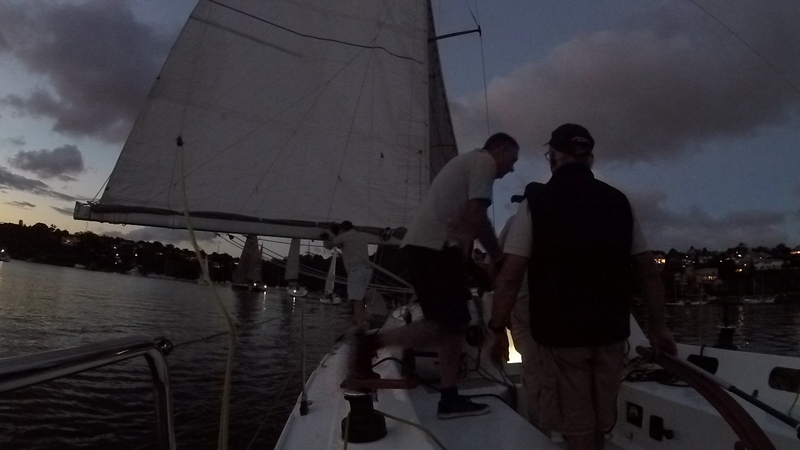 Tonight we had several glimpses of hope and we did manage a 4th fastest and second on handicap but there were three occasions when it looked even more promising. 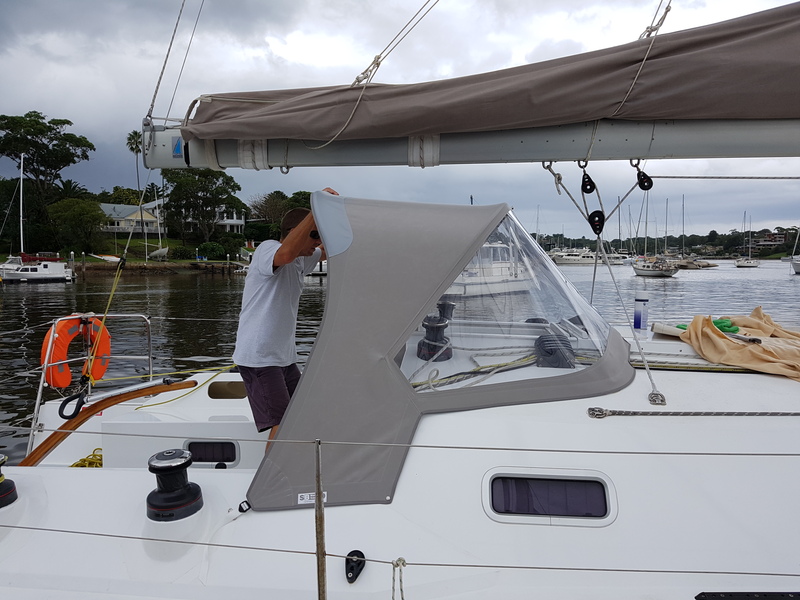 We missed our scheduled clean on the hull this week but our visit to Pittwater on Monday and Tuesday was most likely equivalent to a half clean as we motored through an ocean of jelly fish up near Newport. We could feel the thump thump as we hit jellyfish after jellyfish and I imagine that the abrasion along the hull was enough to remove some of the marine growth. The purpose of the visit to Pittwater was to have our new spray dodger fitted and that happened just in time for the first shower of Monday afternoon. After a quiet night in Refuge Bay we returned to Sydney on Tuesday and were treated to a display of around 100 dolphins just north of the heads. The dolphins provided an entertaining display of aerobatics and it is a shame we could not capture the aerial display on camera. 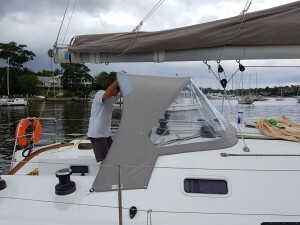 With our semi clean bottom and the biggest set of sails deployed we made a clean start at the pin end on starboard and held Dump Truck out on the line. Joli started to leeward and in clearer air so they pulled away well. 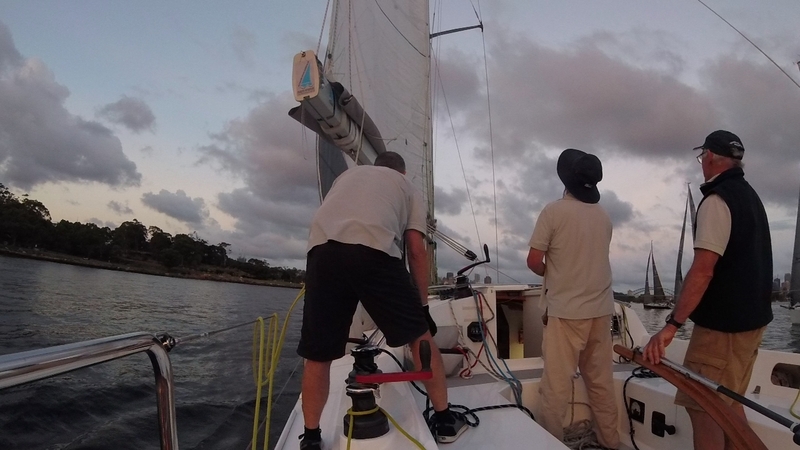 Avalon started in even clearer air but could not cross us on port tack so tacked underneath us onto starboard. Now things got really interesting as we all lifted above Joli and has starboard rights as Joli tried to tack on port to go up Humbug. Somehow Avalon managed to shoot above Joli, probably with momentum but we were left on starboard pinned down by Dump Truck on our stern quarter. When Dump Truck finally tacked so we could go through Humbug we had to take a lot of transoms of the starboard tackers coming off Onions Point and that left us too low for the work out. One of the sterns we took was Utopia but that worked out well as when we all lined up for the work to Goat Island we were ahead of Utopia and had Much Ado V to leeward. Irukandji had escaped unnoticed through Humbug and was well ahead. On the journey to Goat Island we managed to pinch up from under Utopia and work out from above Much Ado V. We will put that down to very careful trimming of the sails and attention to the fastest course to the Island so that at Goat we were very close to Joli and Dump Truck. Here the wheels fell off as we tacked away from a lift and by the time we reached the Goat Island navigation mark the knock we were on which was a massive lift for Joli on the opposite tack, had disappeared. Here we paid the price of trying to over optimize every wind shift and saw Avalon, Joli, Dump Truck and Irukandji draw further ahead. On the run back to Long Nose we set out big genoa on our enormous whisker pole and started to make up ground. tactically we felt the fleet ahead had turned for Cockatoo Island too soon and were becalmed in the lee of the point so we went very deep and on rounding up had a bit of a struggle to get up to the corner of Cockatoo Island. 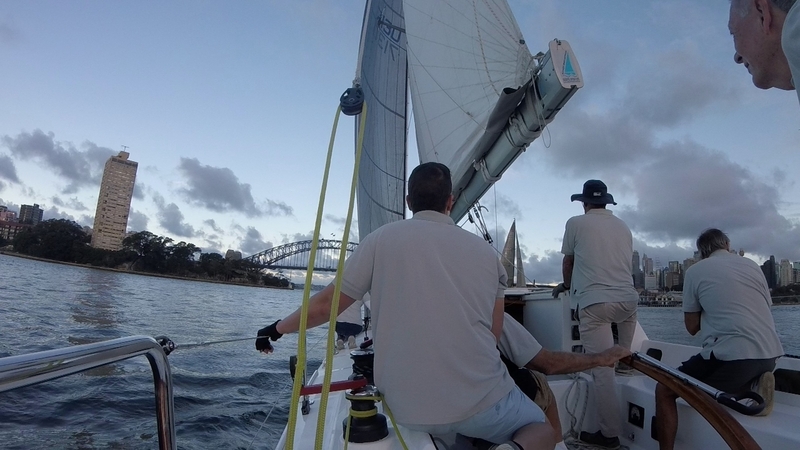 We did make up some ground and on rounding the west end of Cockatoo Island we tried it again by going hard and deep to the Hunters Hill shore. This paid dividends as we sailed through the lee of Irukandji but failed to catch Joli and Dump Truck. Utopia had made up good ground on the leg to Cockatoo Island but went in very close to the Island and failed to capitalize on the move. Once around Clarke Point it was a race to see who could go the lowest to the Onions Point shore and try as we might we could not catch Joli or Dump Truck. At Onion Point we were caught in the wind shadow of an equally large Blue fleet yacht and watched as both Irukandji and Utopia crept closer. As the breeze swung so that we were running by the lee we effectively had clear air and pulled through to the finish line relieved to have held our position. Well done to Avalon who lead almost from start to finish and did finish six and a half minutes clear of Joli with Dump Truck another half a minute behind. Avalon took first and fastest while our handicap allowed us to take second place. The dying breeze did make the finishing times stretch out and after Much Ado V the times really stretched out just due to the dying breeze.